We’ve all been there. Maybe you still are. For some, bees equal stings! This is the traditional view of the bee, rivaling the more positive view of the honey-making glory of our little friends. For many it is a key reason why even the thought of beekeeping is beyond consideration! But just how real is that fear and how on earth do beekeepers handle being stung every day, as they presumably do – right? It’s true that our bees have the capability to sting and when they do it’s no fun. But with so many beekeepers happily doing their thing every day, what’s the true story about bee stings? Let’s look at bee stings and put them in context. You might feel a little more at ease with a better understanding by the time you have finished this lesson. Is being stung a badge of honor for the beekeeper? ABSOLUTELY NOT! We feel strongly about this. We might even burn a few bridges here among more “seasoned beekeepers”. As a beekeeper, can I avoid ever getting stung? It’s true that beekeepers get stung. But there are steps you can take to greatly minimize the chance of being stung and it isn’t unusual to hear of multi-year beekeepers who have not yet been stung. You can easily find beekeepers who openly state “If you haven’t yet been stung by a bee you are not a real beekeeper”. For those folks, it is considered a right of passage. And, to be fair, when – if – you have that first bee sting it won’t be particularly enjoyable but your understanding of the bee and a bee’s capabilities just grew! But is it a “weakness” to have never been stung? No, it’s not. Let’s first consider your actions. Bees sting when they are threatened and, as a beekeeper, practicing natural, graceful and calm actions minimizes the chance of being stung. If a bee stings then “something broke” and you have met a bee that felt the need to defend herself. That is not to say that this situation is always avoidable, but it is a simple fact that a bee stings as something of a last resort (for reasons we will discover below). So how does that translate into you being “less of a beekeeper” if you haven’t yet been stung? It doesn’t! We are being slightly provocative here, of course. 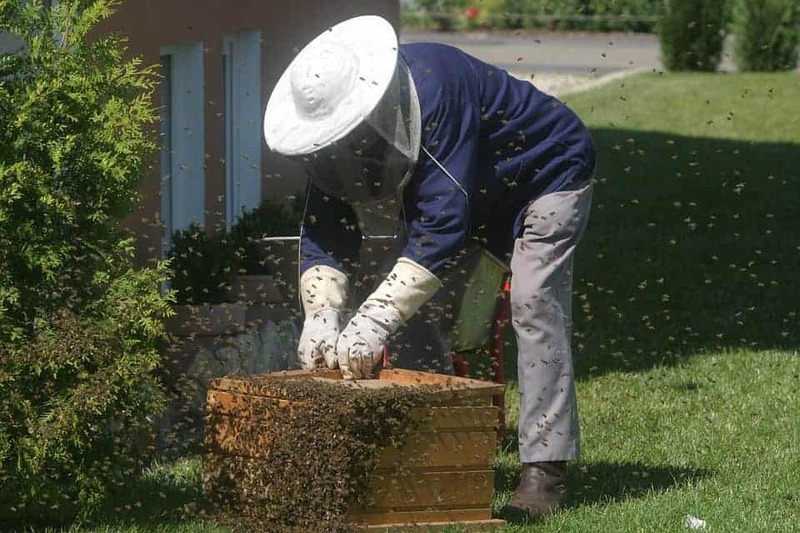 We certainly accept the occasional sting will happen and, when it does, it’s human nature to feel you have “paid your dues” and joined the fraternity of beekeepers. But the idea that anyone who hasn’t yet been stung is, by that definition, less of a beekeeper is misplaced! Let’s put it this way…a beekeeper who hasn’t yet been stung is one who has not yet placed a bee in a difficult position where she feels threatened enough to sting. Does that feel like something to be “ashamed about”? There are some extremely good beekeepers who have never been stung. Really! As one example, one of our contributors was three years into her beekeeping experience before her first sting. The author of this article, went through his entire first year (the “beginner” stage, when he’s less certain, by definition) without a sting. Avoiding bee stings is not rare! It is fair to say that a “frightened” beekeeper is one that is less relaxed. That message somehow gets through to our bees, based on the urgency of our actions. 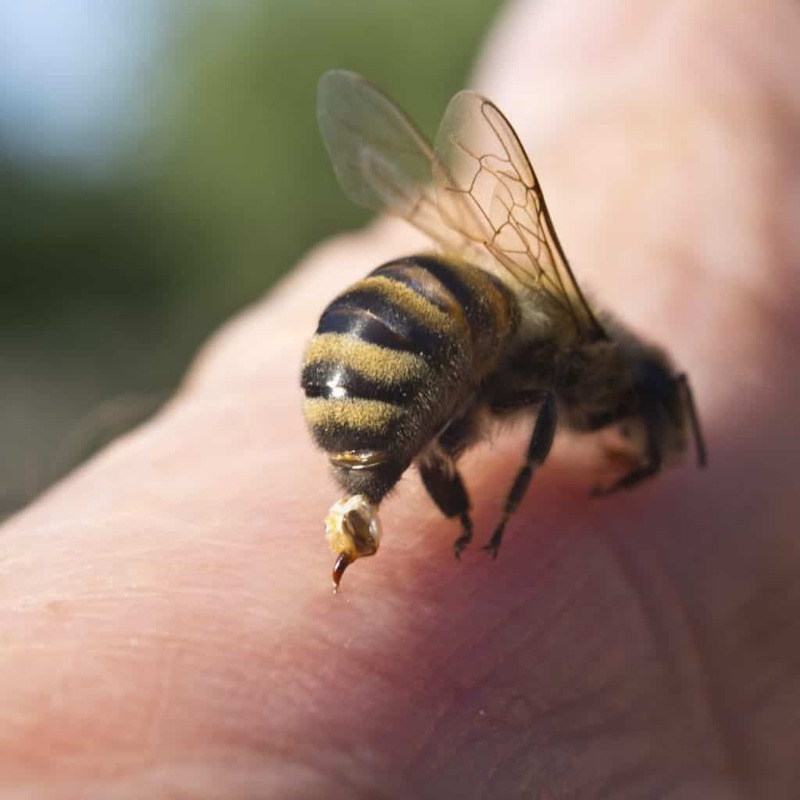 And if it takes a sting or two for you a) to realize that stings are really not THAT bad and b) subsequently act more calmly around your bees – well, maybe it is true that being stung may help you “evolve” as a beekeeper. So yes, we get it! If you happen to be stung, you will probably feel you have crossed a line of some sort! Just don’t let anyone tell you that you are not a real beekeeper till you have. What if you are allergic to bee stings? If you have never been stung by a bee before, it is worth a visit to the doctor to check if you are likely to have an allergic reaction. Only around 2% of the population have an allergy to bee stings and are vulnerable to anaphylactic shock. This is a very serious situation, where your body swells up, including your airway, to the extent you cannot breathe. It is far better to know ahead of time and be prepared. Can I be a beekeeper and be allergic to bees? This, of course, sounds dramatic and for the small number of people with an allergy it is certainly is a serious issue. So it makes sense to be cautious and get checked. Should you avoid bee stings? Did we really ask that question (given what we just said)? Yes, we did and suspect we confused you! Of course, you will no doubt join the rest of mankind and at least try to avoid bee stings. But, believe it or not, there is a qualifier to even that simple statement. The body adjusts to bee stings. Over time the pain lessens as the body reacts. Some beekeepers intentionally let bees sting early in the season, specifically to make subsequent stings less irritating. We are not advocating that, but the fact that some beekeepers take this approach is worth mentioning, to put this in context. Let’s start by looking at bee stings and what they are. Be aware that not all bees have the capability to sting. Unfortunately for us, the most common type of bee and the ones we keep – honey bees – do indeed possess stingers. But even then there’s the qualifier that not all honey bees have or use a stinger. Bees sting when they feel threatened. That’s it! Keep this basic principle in mind and you are already a long way towards understanding your bees and reducing the chance of being stung. So let’s state that again – bees sting when they feel threatened. Bees can make a mistake or two and the important word here is when they FEEL threatened. As you work with your bees in a loving, graceful, calm way you are helping your bees understand that they are not in danger. But if, for whatever reason, a bee feels trapped then there’s the possibility she will attempt to sting. With tens of thousands of bees swirling around and doing their job, all while you are temporarily ripping apart and rebuilding their home – well, you can see the potential here! We have seen how bees use pheromones. One important pheromone is the alarm pheromone (there are actually a couple of variations on this). When a bee feels threatened and reaches the point where she stings, she will emit this pheromone. This is a signal to the rest of the colony that danger is nearby and cause them go in for the sting too. What exactly IS a bee string? Let’s say a bee has decided to sting you. What exactly happens? The dangerous goods are stored in the venom sac. After the bee has stung, the stinger will continue to wiggle and pump venom into the victim until the stinger eventually quits moving or is removed. As you might imagine, this is a good reason to remove the stinger reasonably soon – although most victims are already motivated to do so anyway! The worker bee stinger is barbed, which nature has created very specifically to dig in and do damage! Great news! Bee venom is around 88% water, by volume? What could go wrong?!!! Well, the other 12% isn’t that great. How does the 88% water content impact the sting? Not in a good way. The water content helps with the “distribution of pain”. Bees tend to sting in moist tissue. This allows for the venom to be dispersed pretty quickly. Bee stings includes a venom called apitoxin. This is made up of multiple proteins, which have many different effects on people. The main ingredient is the toxin mellitin which is, incidentally, a peptide that is now being used to treat diseases. By dry weight, mellitin comprises about 50% of the venom. Think that’s the full story? Let’s throw in some histamine, to ensure capillaries leak fluid, causing itching. How about some apimin, to destroy nerve tissue? Or some hyaluronisase to break down cell tissue? Nature has designed bee venom to be very effective at what it does! As beekeepers, we’re focused on the honey bee. The good news is that not all honey bees even have a stinger, let alone use it. The bad news is that the bees that have stingers and more likely to use them are workers – which make up probably 95% or more of the bees in your hive. Drat! Drones don’t have stingers. So that’s simple! Pick a drone up, roll him around (gently, because you are a kind soul) and whisper to him you have evil intentions – but he still won’t be able to sting you! Queens have stingers but rarely sting. It is rare to hear of people being stung by a queen, even if only because of the numbers (thousands of workers vs. one queen). But she is certainly not inclined to use her stinger anyway. Workers have stingers and know how to use them! If we are stung by one of our bees, it’s almost certainly a worker. How do bee stingers differ? Let’s consider the differences between worker and queen stingers (given that the drone is a non-player in the world of stings). Worker stingers are barbed. This is often their downfall. As they sting, the stinger is inserted into the target. When the worker tries to pull away the stinger remains in the target, along with plenty of other “bee parts” too. That’s a dead worker bee right there! In fact, this story of workers meeting their maker when they die needs to be qualified somewhat. We tend to assume this happens all the time because when they sting human skin they do indeed tend to die. This is due to the toughness of human skin and its role in ripping out the stinger. But worker bees can sting other targets which are less tough and live to tell the story if the stinger can be withdrawn cleanly. Queens have stingers but they are not barbed. This means they can sting and sting again (even human skin) and the “death by barb” issue is not a factor. The primary use of the queen’s stinger is when she checks for unborn sister bees in the colony after a swarm, hunts then down and stings through the capped cell to kill them. How do bee stings feel? Not good! You really don’t want to be stung by a bee. However, you probably don’t want to be hurt in general so, in that regard, bee stings are just another event to be avoided. In reality, it’s difficult to put an estimate on the degree of pain for a number of reasons. The pain varies. First, the degree of perceived pain is dependent the location on the body where the stinger lands. As a rule, stings on or around the face are bad news at so many levels and will pack a punch. You REALLY want to avoid being stung on the head, even more so than other parts of the body. The body adjusts. Our bodies are remarkable and will adjust to handle the pain a little better as you are stung more. The itching. For many it’s not really the sting itself that is the most discomforting, but the itching afterwards. What can you do to prevent bee stings? Assuming you are not in the “not a real beekeeper till you are stung…” camp, it makes a ton of sense to minimize the chances of being stung with protective clothing. Let’s make a simple statement – protect your head! That’s a common message you will see from PerfectBee. Stings on other parts of the body are not good and are also to be avoided, but they can generally be tolerated. But stings to the wrong place on the head can do much more damage than merely a little pain. Commit to never doing a hive inspection without at least a veil to protect your head. It’s just not worth doing otherwise. Again, it isn’t too difficult to find a more experienced beekeeper who feels this is unnecessary. But we urge real caution, because the damage from a sting in the wrong place can greatly outweigh the minor inconveniences of covering your head. Bees read us. Regardless of if or how they do this, it is easy to see a relationship between how we act and how they act. One of the best habits you can learn as a beekeeper is the art of being calm and gentle around your bees. A hive inspection is a rather intrusive act. We take the roof off our bee’s home. Depending on the type of hive, we might break it apart into chunks (we’re thinking about the removal of boxes here)! Then we go inside each of those chunks and – one-by-one – take out big sections of their home (the frames). We do all this while our bees are at home and wanting to conduct their business. Yet, in the big scheme of things, bees remain pretty calm despite all this. They generally just carry on and ignore us. Even when we lift out a frame, the bees on that frame will just keep on doing what they are doing. It really is a special thing to watch. The majority of inspections we do, even with all this upheaval for our bees, do not involve a bee sting. Bees tolerate us well! Yet if we go at this abruptly or aggressively our bees can be visibly shaken. Their response to our inspection can shift from casual indifference to a much more frenzied situation, evident both from the volume of buzzing and the number of airborne bees. And THAT increases your chances of being stung. Approach your bees with respect and with calmness and you will go a long way towards reducing the chances of being stung. Bees dislike wind, rain and cold. Avoid these wherever possible and wait for a warmer, sunnier day. This is really just a probability factor, but consider timing your inspections to be between mid-morning and mid-afternoon, when many workers are out foraging. 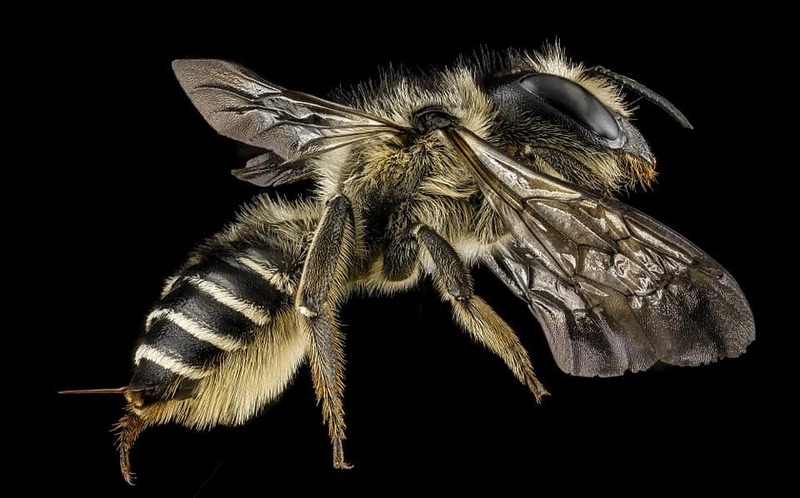 Bees dislike dark clothing, since they perceive it as more of a threat than the traditional white protective clothing that most beekeepers wear (who choose that color for precisely that reason). You may be surrounded by 60,000+ eager bees and you think swatting a bee is going to help? See above (calmness….)! Bees can fly up to 18 mph. You might want to reflect on that before you turn yourself into this rushing torpedo – at all of 10 mph – that bees will see and catch quite easily. If you have been stung, gather your wits, keep your cursing to yourself and calmly walk away from the hive to remove the stinger. That very intentional calmness, albeit in the face of a little pain, will go some way towards reducing the chance of another sting. They don’t. We are hoping we don’t need to expand on this but going over the top with your perfume or aftershave isn’t a good thing! Smokers – which are not always a requirement – have the apparent effect of calming your bees. Ironically, this is actually because they are freaking out! It is thought that the smoke you waft over the hive is interpreted by bees as “Fire!!!”. Their first thought is to get out of there. But they also know that if they leave they need to be full up with nutrients, since their new home won’t have honey. So, they dive back into the hive and start eating! Smokers are an effective tool in “calming” your bees. You ignored the guy (it’s almost always a guy!) who tells you that you can’t be considered a beekeeper till you have been stung! You are the one who treated your bees with respect, acted calmly and followed best practices around them to reduce the chance of being stung. You are all over this and have it nailed. So, that makes you a thoughtful beekeeper. Except…. you just got stung! It happens. Now what? First off, resist the urge to panic. Yes, it’s going to hurt a tad but, as we’ve seen, that only makes things worse. Because a bee that stings is giving off the alarm pheromone inviting others to join in the fun, step away from the hive and take care of things. No one likes the idea of venom flowing in your body, so you are going to be pretty motivated to remove the stinger. The longer the stinger remains the more that venom will irritate. There is something of a debate about this point. A long-held theory is that it’s more important to gently and very carefully remove the stinger, so as to not risk breaking the venom sac more, thus releasing more venom. This has resulted in all manner of suggestions as to how to gracefully and gradually remove the stinger, in no hurry. A common suggestion is to scrape the stinger out with an edge of something like a credit card, rather than pull it with tweezers. The general thinking has evolved now to the point where the time taken to remove the stinger is considered more important than whether the venom sac is broken. So, focus on getting the stinger removed reasonably quickly rather than “artfully”. With the stinger out, time to protect the wound. First wash the area with soap and water, to reduce the possibility of infection. The success of this will vary from person-to-person, but ointments can help a great deal. Have a tube handy in your beekeeping suit or toolkit. Whatever you do, don’t scratch the wound, unless you have a cunning plan to extend the pain! The wound may start to swell. If so, combat that by placing it on ice to reduce that swelling. After a sting or two (or maybe earlier!) you will realize that the worst part of a bee sting is not the moment of the sting but the potential for itching and swelling that comes later. If you have signs of either, then take some Benadryl and take a rest. We don’t adhere to the belief that you can only consider yourself a good beekeeper when you have been stung. But we also know that stings do happen. With the qualifier about the 2% with an allergic reaction, bee stings are nothing to be scared about. Understand why bee stings happen. Learn how to minimize the possibility they will happen. Have a calm, measured plan if you happen to be stung. I laughed, I cried, I dried my tears and finished reading. Why no mention of the death of bees after said sting?